Author creates travel journal for children. While on a three-week road trip with her grandchildren, author Candy Atkinson kept a personal travel diary so they could remember where they went and who and what they saw on their journey. 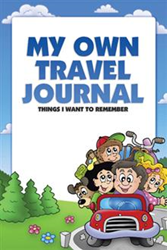 Wanting to provide a place where children could document their own vacation experiences, she created “My Own Travel Journal: Things I Want To Remember” (published by AuthorHouse). A children’s travel journal, the book begins with a few instructional pages that teach children the basics of journal writing. This is followed by a page dedicated to trip notes and then by ample space for children to record their experiences in words and/or pictures. “My Own Travel Journal” includes enough pages for journaling that it can be used for two separate trips. “Children will gain the benefits of learning to journal. This will be of value in school assignments, essays, composition, as well as being a record of the travels a child takes,” Atkinson says. Although designed for children 8 to 12 years old, the journal is ultimately suitable for all ages. In a digital world, it provides a lasting record of cherished family vacations and memories that won’t become lost and forgotten. Candy Atkinson spent her first 40 years in Southern California before moving to Nevada and then to Arizona. She started writing in journals in her 50s and loves how she can document her experiences and feelings and look back later to recall events that she does not want to forget. Atkinson is now retired and living in Arizona. More information can be found at: myowntraveljournal.com. AuthorHouse is an Author Solutions, LLC, supported self-publishing service providing book publishing, marketing, and bookselling services for authors around the globe. Committed to providing the highest level of customer service, AuthorHouse’s team provides guidance throughout the process. For more information or to publish a book, visit authorhouse.com or call 1-888-519-5121. For the latest, follow @authorhouse on Twitter.